Dr. Nidhi Anand Anchan has obtained her MBBS Degree from RAK Medical And Health Sciences University, Ras Al Khaima in June, 2014. She Completed her one year Internship from September 2014 to September 2015, At Saqr Hospital & Saif Obaidullah Hospital, Ras Al Khaima. Dr. Nidhi currently holding DHA license under title – General Practitioner. 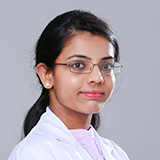 Dr. Nidhi completed her Electives Training in General Surgery Department from Academy Of Medical Sciences Pariyaram Hospital for a period of four weeks (July 2013 to August 2013 ). Dr. Nidhi has attended many workshops, courses and conferences.